Don’t remember if you’re a fan of A Prairie Home Companion, but one of Garrison’s recurring themes in the “News From Lake Wobegon” segment is what I call tomatonesia. 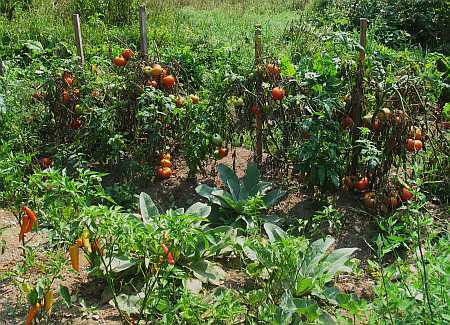 Basically, people forget – every Spring – that two or three tomato plants are sufficient to feed a family of four,… and plant a half-acre. With the result that, about this time of year, folk are sneaking around late at night with boxes of tomatoes, leaving them on neighbor’s doorsteps. Of course, the neighbors are doing the same thing,….. If you don’t have your own, there’s nothing better than a tomato fairy to make a summer’s day complete. ‘Course an Organic Corn Fairy can do worlds of good too! The end of Summer is a glorious time for eating local! i love tomato sandwiches or a tomato salad with fresh basil and maybe some fresh buffalo mozzerella or feta. My dearest Runt, try this some morning you are running around doing chores. It takes very little prep: your oven does all the work. You’ll need a whole new bottle of the best olive oil you can find, and an armful of fresh basil, which I think you have. A small mountain of garlic and some whole green or black peppercorns completes the list. The garlic is limited only by what you are willing to peel. Trim off bruises and spots, and quarter the tomatoes into a non reactive baking dish of about 3 inches in depth. You’ll probably need more than one dish, but the depth is important for liquid consistency in the final product. Drizzle an unconscionable amount of olive oil, and several handfuls of crushed cloves into each baking dish (are you salivating yet? ), along with a generous hand of peppercorns,and put into your oven at around 250 degrees for several hours or until the tomatoes are soft and the liquid bubbles. Now would be a good time to make sure you have some really good bread on hand. Go do some chores, and come back around lunch time. The house will smell tantalizingly good. Trim and wash your basil until you have just leaves, and sink as much of it into each baking dish as the liquid will allow. Completely cover the basil or the leaves will burn. Continue slow roasting for another couple of hours, or until you just can’t stand it anymore. The tomatoes should be collapsed and the liquid rich. Let cool some, and indulge with bread and crisp, cold white wine. Consume with abandon! If you have some left over (maybe on the second or third batch!) I recommend canning in pint jars, standard method with a 15 min. hot water bath. This tastes wonderful in February with a little chicken over pasta. Enjoy! My bounty this year is cucumbers, with which I just can’t keep up. My first leeks came out of the ground today. Mmmm, roast chicken with braised leeks comes to mind. I second Sherry’s tomato sandwiches too! P-Dawg, I only planted four! But the plants have broken themselves down dead with the weight of their fruit. The good news: I have a second crop of “volunteers,” the plants which spontaneously appear from other years’ gardens, with cherry tomatoes just coming in and other toms pinking up. Good year for the nightshades, yes? Sherry, I’ve been absolutely lascivious in my appreciation of tomatoes and basil and herbed mozzarella with a little balsamic vinegar and obscene amounts of freshly cracked pepper. Ultimate Spawn and I both eat right out of the dish as I’m making it; she’s a walking-talking vindication of my gardening efforts. I think my last gift to her as she goes off to BU in a week will be a tomato salad. And Miz Lu, I hope you know me well enough to be kidding with that recipe! I mean, those ruby orbs barely make it in the door before they’re sacrificed to the gods of gastronomic avarice! Tell you what: I’ll supply the fixin’s, you heat up the oven, and we’ll have a sit-down. I’m serious. I can’t bear to see this stuff go to waste. When are you around? Have you tried pasta tossed with fresh tomatoes, olive oil and salt? Miz Lu and I will be around over the weekend. Stop by anytime, though we have tickets to see Marion McPartland at Tanglewood on Saturday afternoon. FB, Cool, I’ll stop by , um, don’t know when – I’m taking Ursi to BU on Sunday, so that could be a loooong day 😦 , 14th floor and all. She’s in shock. But I’ll try to stop by. And enjoy M McP for me!